The location of this proposed new semi-detached house is situated at the end of a cul-de-sac lined with Georgian and Victorian terraced houses. These are good examples of the type of traditional terraced houses that are predominant feature of the Blackheath Conservation area and in particular Character Area 13 (Quentin Road, Belmont Park, Dacre Park and Eton Grove) as defined in the most recent conservation area appraisal. 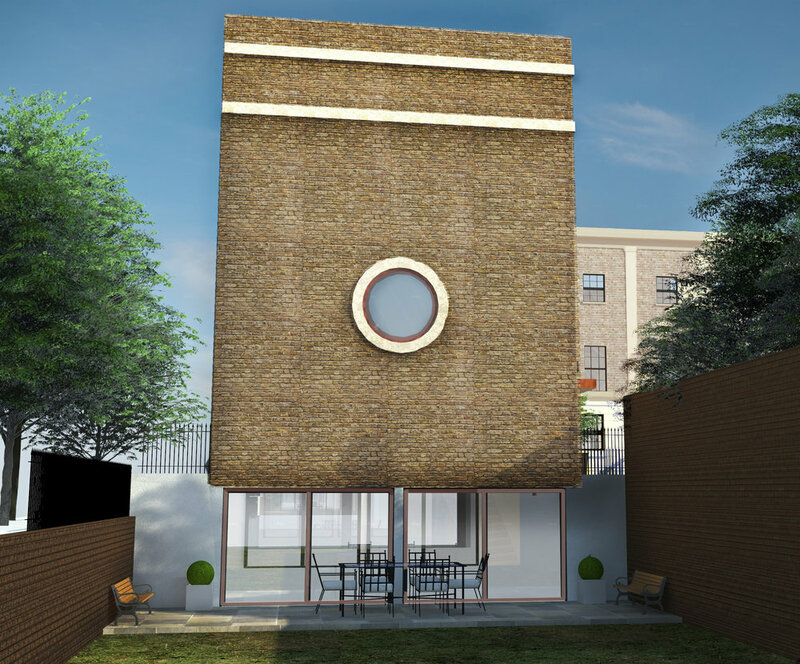 The proposed site, although plainly visible and fronting this cul-de-sac at the end of Eton Grove, is in fact addressed as 34 St Margaret’s Passage. This passage is located behind Eton Grove, therefore the site can be access via both St Margaret’s Passage and Eton Grove. The existing house was built circa 1970 and is an odd arrangement with no clear orientation in relation to the road. The house is rendered generally, however it has an exposed brickwork chimney and features, giving the outward appearance of no clear character in terms of materials. The composition of the facades, which would have been a feature in this grand streetscape, has no clear merit or organisation. Outwardly the house does not seem to have been designed with any notion of character, proportion, orientation or reference to anything other than the front driveway and porch. For these reasons, the Client who wishes to demolish this house and has seen an opportunity for great improvement. Given his desire to want to build a Victorian inspired semi-detached house, which fronts and highlights the grand streetscape of Eton Grove, he sees himself living here and improving what is a lost opportunity. 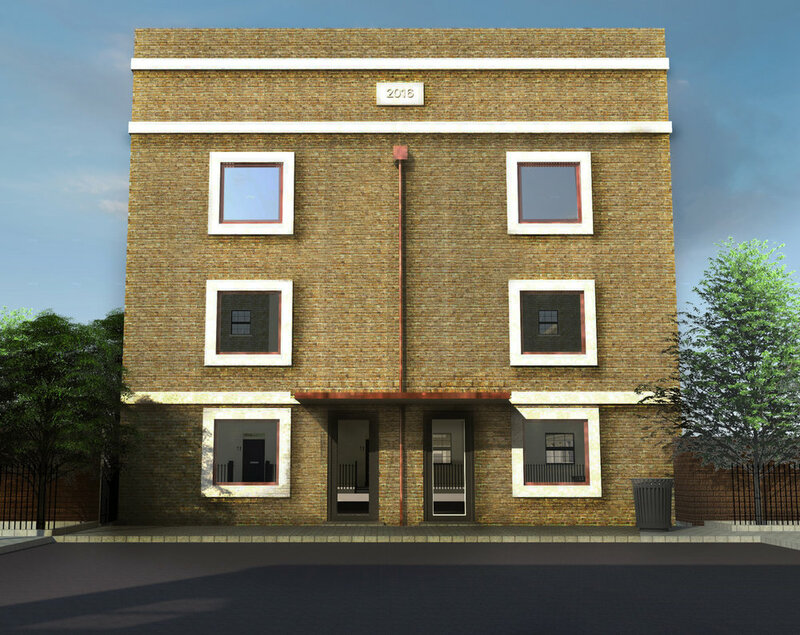 All Options 1, 2 and 3 would incorporate the same proportions, architraves, roof, eaves, windows and steps as the neighbouring terraced houses along Eaton Grove. The footprints of all options are an exact match of two of these houses. Option 1 would sit with a deeper plan than Option 2, which would be orientated adjacently at 90 degrees and have a wider and less deep plan. Option 2 would have gardens for each house, whilst Option 1 would only have gardens for the main house with simply bicycle store, bin store and perimeter planting adjacent to the flats. Option 3 would have both sides facing the street as does Option 1, however this option would allow both houses to have gardens to the side. This is facilitated with lower ground floors orientated sideways to the gardens and upper ground floors 90 degrees adjacent facing the street. In this way a novel use of the level change will facilitate two houses both having gardens. 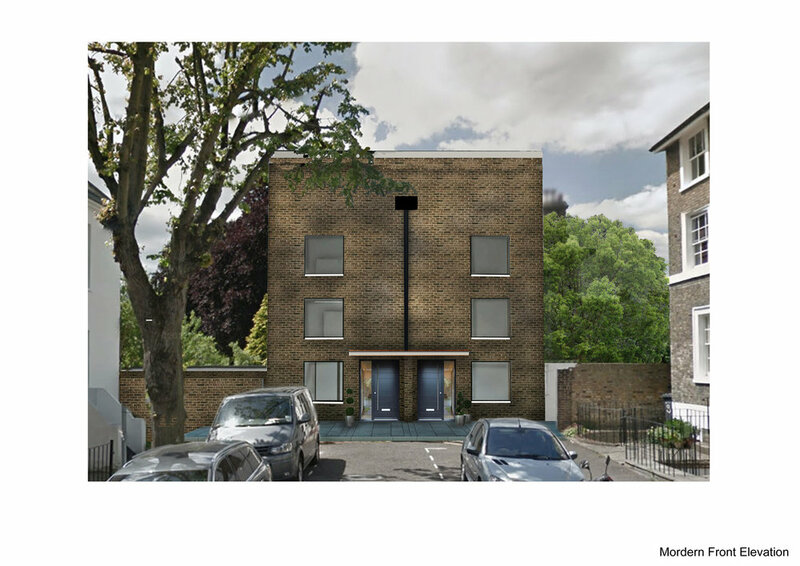 The proposed semi-detached house, as shown in Option 1, has two units (apartments and a family house) facing the streetscape and accessed directly from Eton Grove. This double frontage would facilitate the creation of two new parking spaces and spaces for bicycles and bin stores at the front. Also a pavement would be created to continue the existing pavement with the opposite sides of the street. 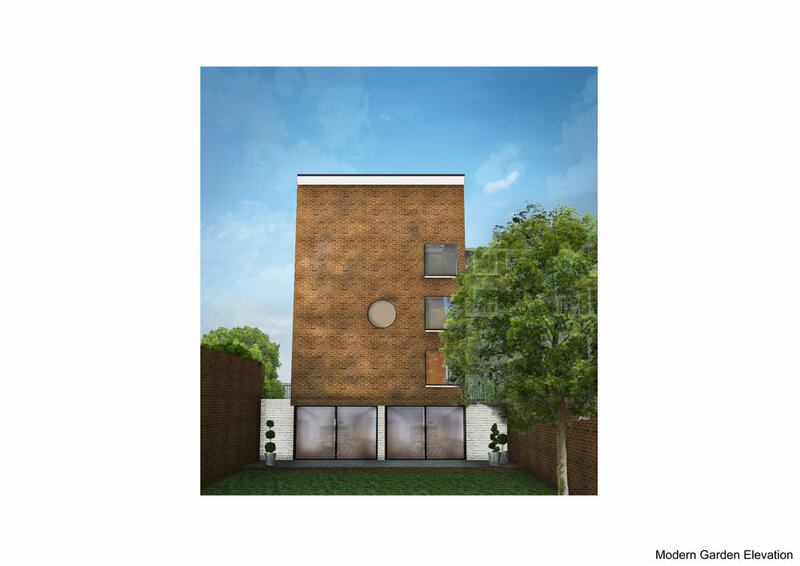 The alternative proposal in Option 2 shows a semidetached house of two 4 bedroom units. 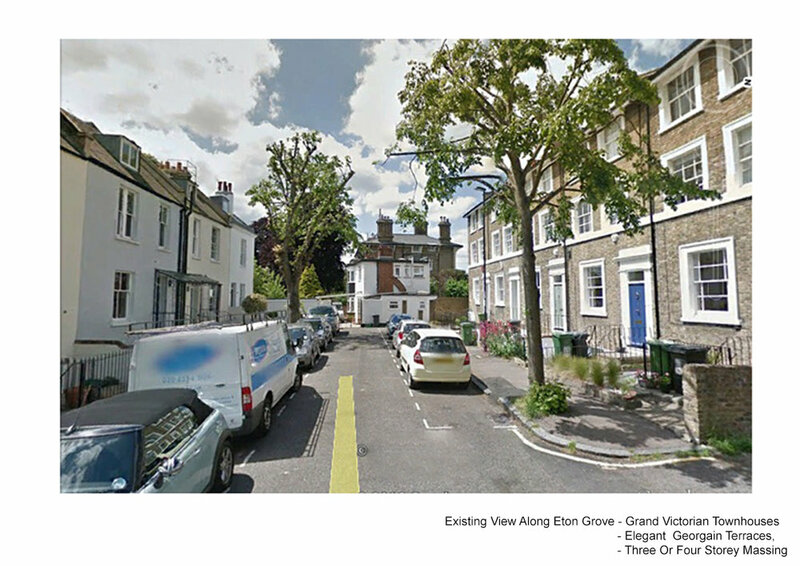 One house is accessed from Eton Grove and the other is accessed from St Margaret’s Passage. The semidetached house in Option 2 would be longer in footprint than Option 1, which is deeper. 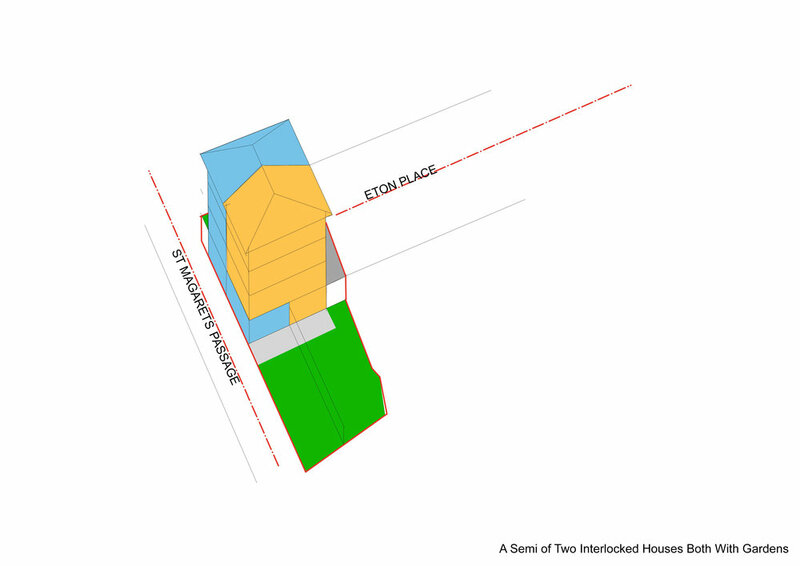 The house shown in Option 3 has two houses each accessed from Eton Place on the upper ground floor. The floors below turn 90 degrees to the left so that there is a wrap around on the lower ground floor that offers access to gardens for both houses. The lack of design and character of the existing house does nothing to enhance the local grandeur of the street and area. The house in fact is out of place, badly orientated and badly designed. Its demolition would not be a loss. In fact Lewisham Council did not register it in their Conservation Area Assessment as being a house with a positive impact. A new house, however, that referenced the architecture of place and streetscape, would enhance this streetscape. The location of the house at the end of the street in line with the axis could be a feature and backdrop. A new house with a nuanced balance of Victorian components and one or two contemporary features would make the street complete, raise and refresh what is at present a “dead-end”.